Hello Spring! It’s so nice to see you! The sunshine and warmer temps just make everything better. Winter has felt long and hard, and I’m so glad to see it go. 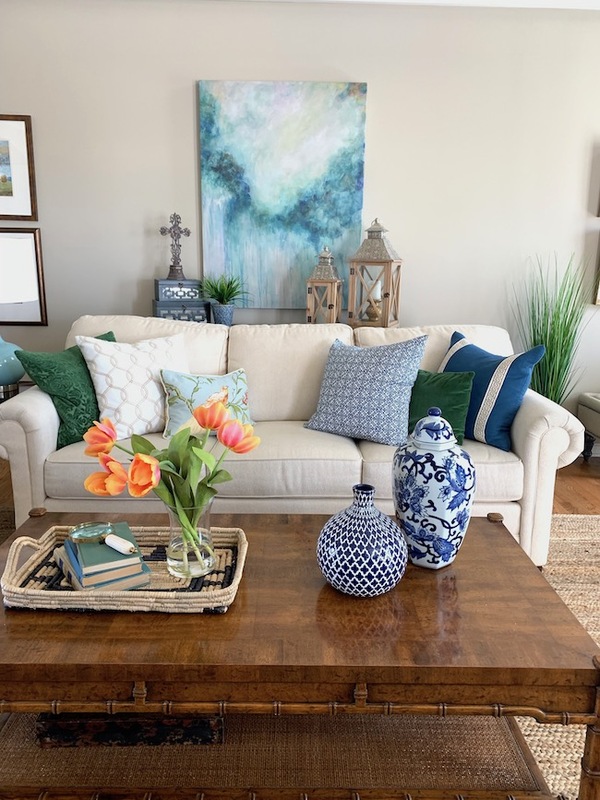 Today I’m giving a quick little spring tour of our home and sharing a few fun and fresh ways to decorate for spring. 1. 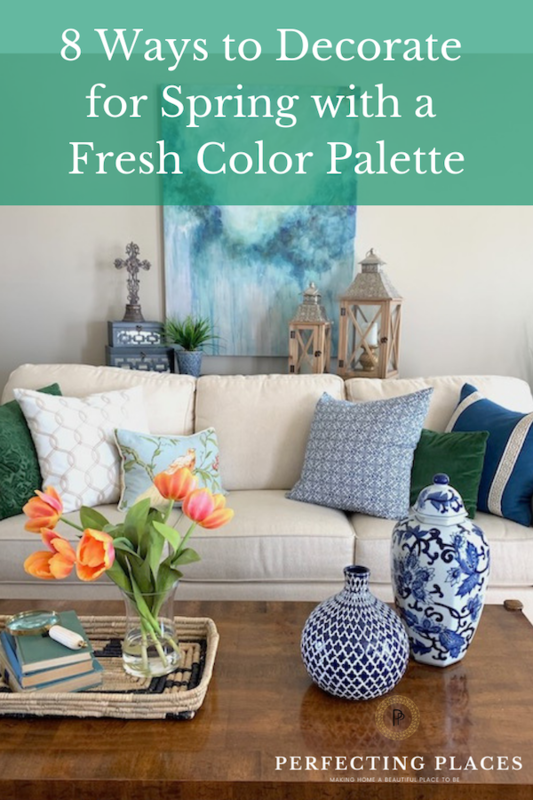 Choose a fresh color palette to decorate for spring. Veer away from typical pastel colors as you decorate for spring, and add some punches of fresh color to your decor. Vibrant corals, greens, and blues continue to be going strong this season. I’m loving orangey-coral tulips, roses, and Gerbera daisies for my arrangements. This color pairs so well with the blues and greens in my color scheme. 2. Use pops of bold colors with your neutral palette. Our open floor plan dictates a neutral color palette for the walls, but that doesn’t stop me from adding pops of color through my accessories. 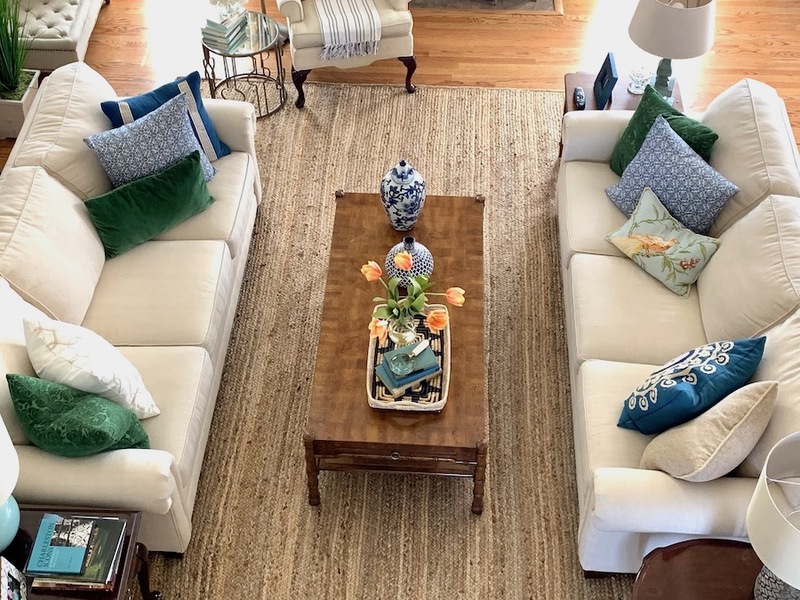 I’m always drawn to blues and greens, but my favorite way to breathe life into a room is to add a pop of warm color through accessories. The corals and oranges provide the perfect pops to my other-wise analogous color scheme. 3. Mix fresh flowers with faux as you decorate for spring. Flowers are the perfect way to decorate for spring with fresh colors. I know, I know … you can’t touch the beauty of fresh flowers. But listen, who has the money or time to constantly replenish vases with fresh flowers. Don’t get me wrong, I LOVE them, they just aren’t practical to use for everyday. I like to look at the pretty blooms the entire season, not just for a few days. There are so many pretty options for faux flowers available now that look SOOOO real. TIP: Choose colors that are ACTUALLY real flower colors (no blue tulips). Those arranged in acrylic “water” look the most true-to-life. Bring fresh flowers for your table for special meals and gatherings. The most important thing is use what makes you happy, and that’s really all that matters. Mix in a little of both! 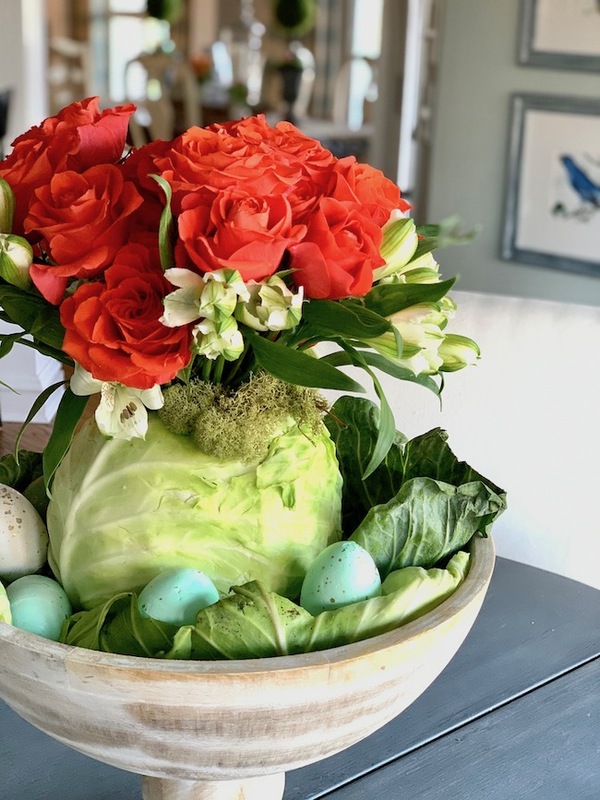 I created a fun and fresh spring arrangement using a head of cabbage as the “vase” in this beautiful wooden pedestal bowl. I love how the roses pop against the vibrant green of the cabbage. See the how-to video below. Love the wooden pedestal bowl? 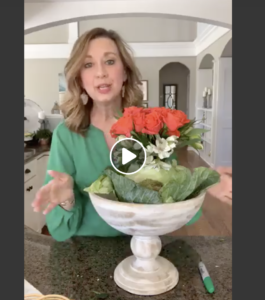 Here’s the link to it and check out the video of how I made the arrangement below. 4. Lighten up the feel and texture of your decor with baskets and woven textures. Adding fresh woven baskets and textures to your decor lightens the look. Adding light woven pieces creates a light airy feel for spring. 5. 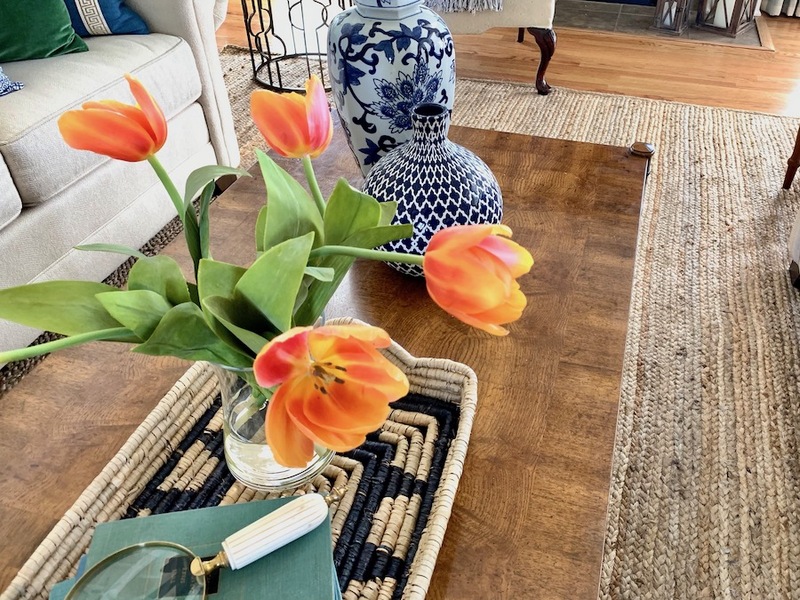 Use jute or natural fiber rugs for a fresh spring look. 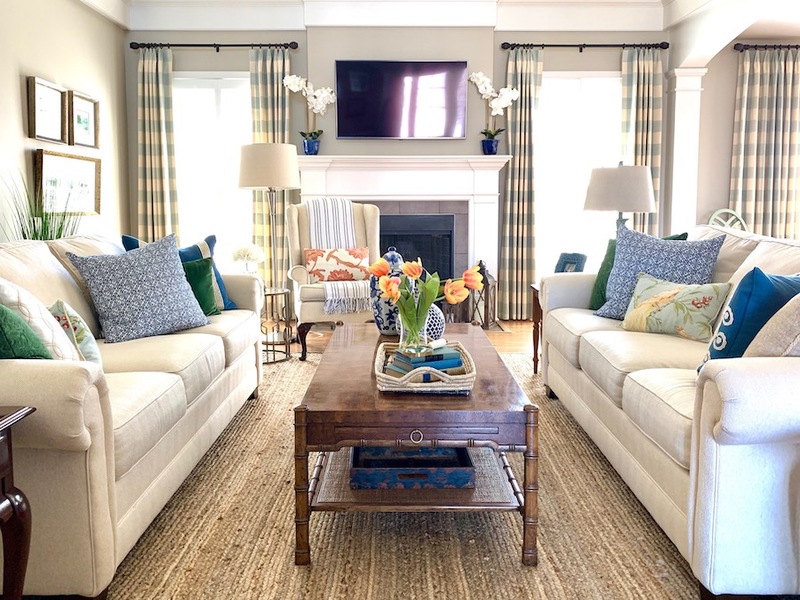 Replace heavy carpets or area rugs with light, woven natural fiber rugs for spring and summer. 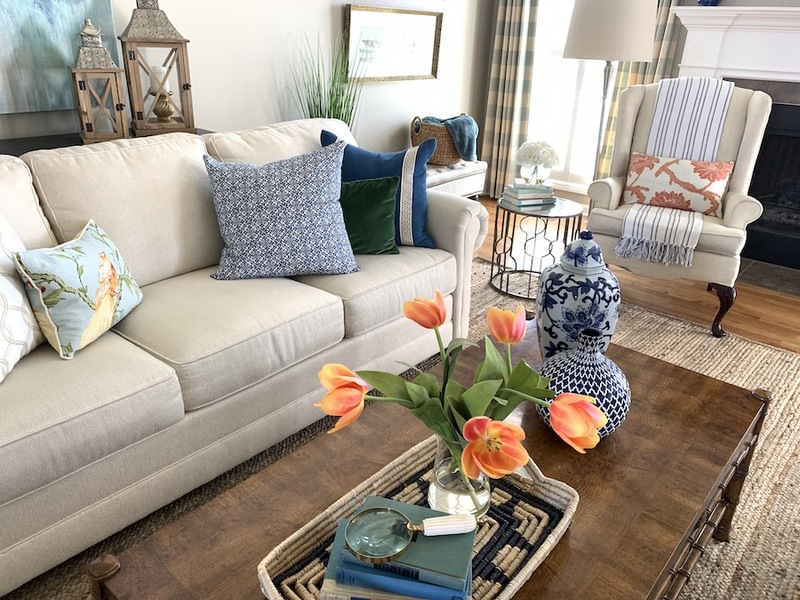 They create a natural backdrop for the pops of fresh spring color, and the natural fiber creates a more relaxed vibe for your home as you head into the warmer months. We just replaced our carpet with hardwood this winter, and are loving our new jute rug this spring! I can’t get over how soft it feels! 6. Use pillows to pack a punch. I love beautiful textiles and fabrics! Bring in some fresh color and patterns for spring with new throw pillows. I love this pretty navy and white pair I found at TJ Maxx. 7. Use a spring throw and pillow to update an old chair. My old wingback chair is pretty worn. 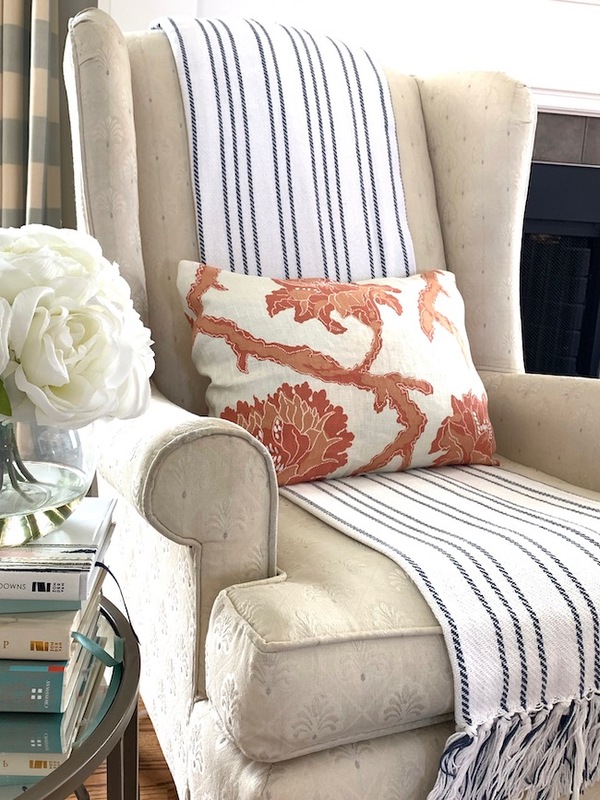 I’m using an off-white and navy striped throw folded down the center of the chair, paired with a pretty orange and cream lumbar pillow, to brighten up the chair a bit and get another season out of it. 8. 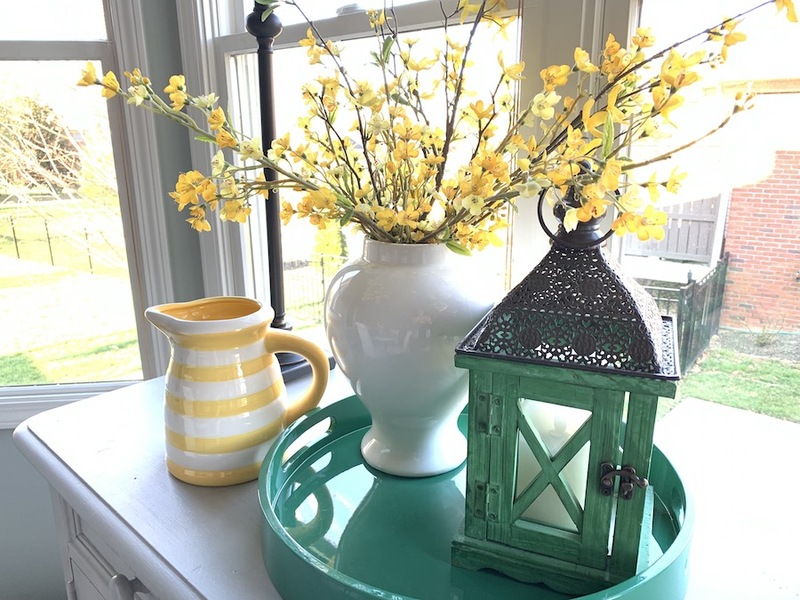 Use trays and bowls to collect and display pretty spring items. Trays make everything look prettier! They unify and add substance to centerpieces and tabletops. 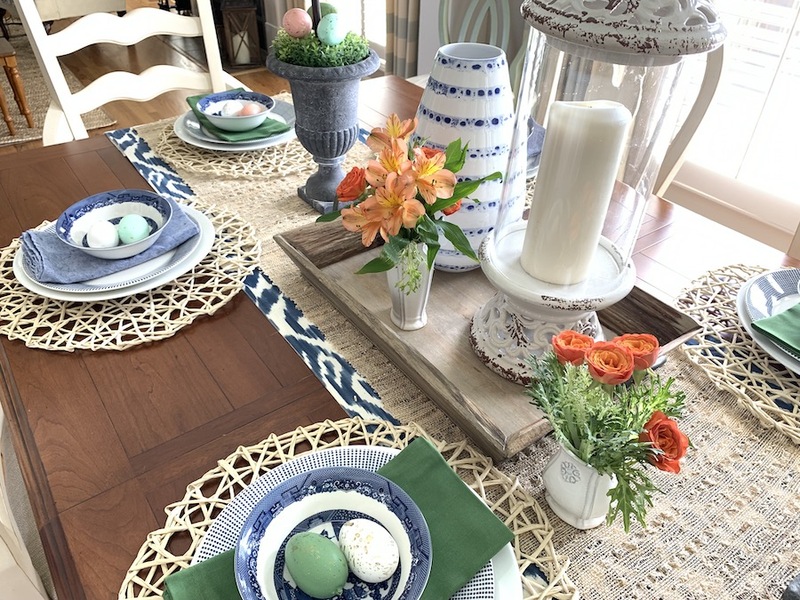 Use trays and bowls to show off pretty easter eggs, lemons or limes, candles and floral arrangements. This pretty green tray adds a pretty pop of green to our kitchen buffet, and the lacquer finish will be perfect to use for outdoor entertaining as the weather warms. 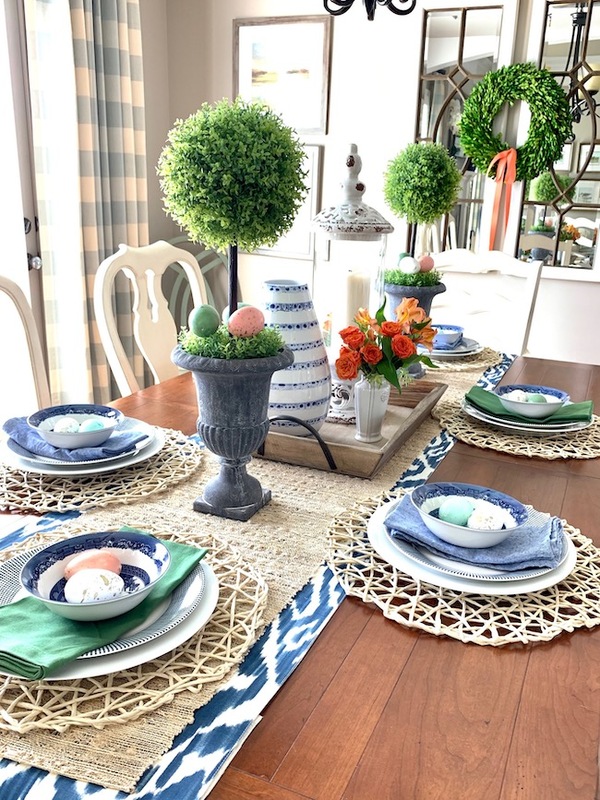 I hope this inspires you to add some pops of fresh spring color to decorate for spring. Say goodbye to winter and bring on the sunshine of spring! 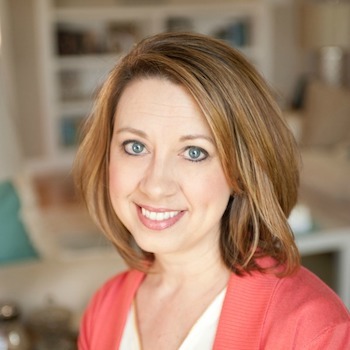 If you’d love to freshen up your home this spring with paint color or by redoing a room I’d love to help! Contact me to set up a consultation!